In recent years, candy “poop” has become a popular gag gift for the holidays. It’s really just a bag of candy with a poem on it that indicates the contents came from the wrong end of a holiday character. Popular “poop” includes pumpkin poop and ghost poop for Halloween and snowman poop and reindeer poop for Christmas. But how about Santa poop? He’s a magical character, too, and if his reindeer and elves can produce candy poop, then all the residents of the North Pole must have the same ability, right? 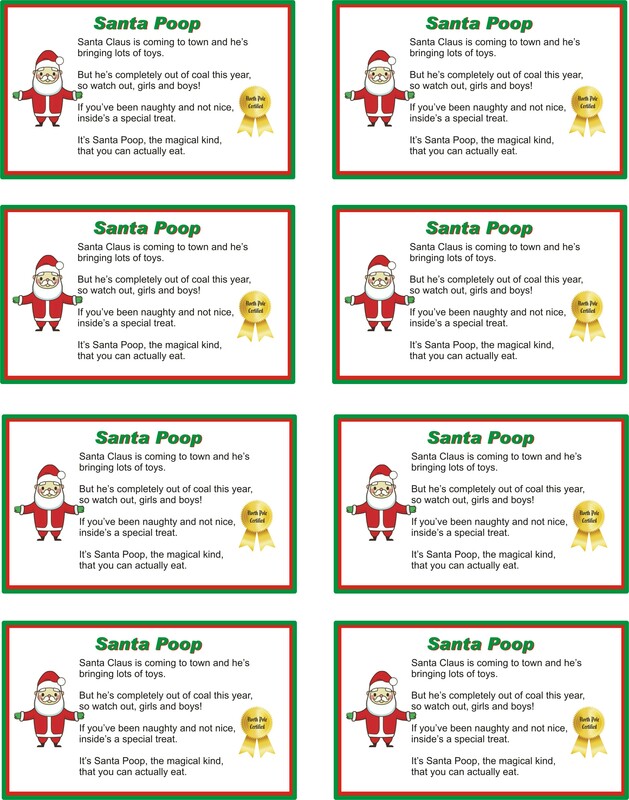 To make Santa poop, simply pour some red and green holiday M&Ms in a plastic bag, seal it tight, and then download the printable poem shown here. There are six labels on the page, which you can cut out and attach to your gift bags. Here’s the poem that appears on each label. And he’s bringing lots of toys. So watch out, girls and boys! that you can actually eat.